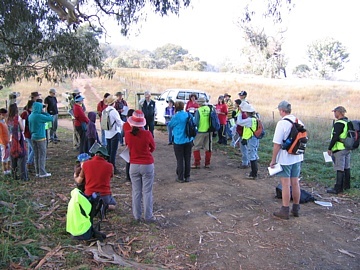 At 9 am on 1st May, 32 fotpin members, family and friends gathered at the Dungowan Street entrance to the Reserve to assist with the first count of kangaroo numbers to be carried out on the Pinnacle Nature Reserve (PNR). The count was repeated in the afternoon by 24 mostly different people, making this fotpin's largest ever participatory event. Not surprising given that it was a perfect Canberra autumn day. The event was nicely evoked by Rosemary Blemings' "A Sunday walk with a difference". 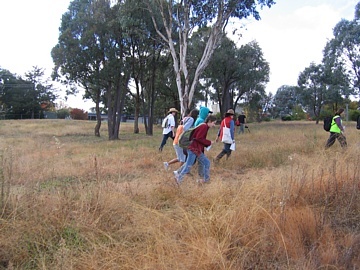 The fotpin Coordinating Committee requested that the Pinnacle Nature Reserve (PNR) be included as part of the series of kangaroo counts being carried out around various parts of the Canberra Nature Park in autumn 2011. Unlike the other counts, this one was carried out predominantly by volunteers organised by fotpin. 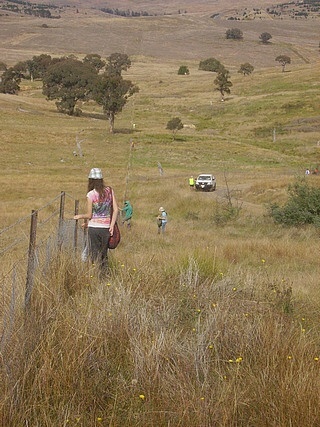 The experts were on hand to drill us in the procedure and guide us through the process of a "sweep count"; Don Fletcher and Claire Wimpenny from the Office of Conservation Planning and Research, in ACT Land Management and Planning gave up their Sunday to join us. There are a number of ways to estimate kangaroo numbers (as described in Appendix 1 of the ACT Kangaroo Management Plan, 2010). A "sweep count" was deemed the most suitable for our purposes. Because kangaroos move freely between the Reserve and the adjacent properties (North Kama, Bottom Pinnacle and the rural lease - see location map) bounded by William Hovell and Coulter Drives, the whole area was counted. The rural lease was included with the lease-holder's permission, while the other two areas are managed by the ACT Government. The area covered is shown in the sweep map below. After a briefing from Don, we started from the Dungowan Street entrance with two teams (1 and 2) sweeping from west to east as shown by the yellow arrows. Both teams formed a line of equally-spaced counters to carry out the sweep. Team 2 stayed withing the PNR, while Team 1 had the difficult task of moving further and faster through the greater arc as we swept around to the red line labelled with the large 3. Not only was the distance covered by team 2 longer, but the areas through which they travelled had not had the benefit of thistle slashing that the PNR had, so it was prickly going. The idea was to have people within view of each other along the line, but far enough apart so that kangaroos would not feel too stressed to pass between them. Kangaroos passing through the line were counted. 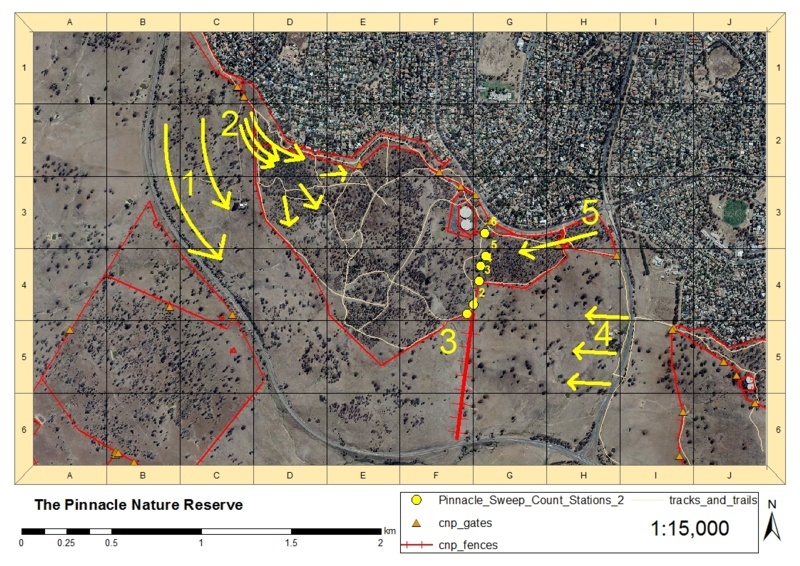 When we reached the red line labelled with the large 3, people were left at regular intervals along it, as indicated by the small yellow numbers and red dashes (the photo to the right shows a view of the line looking south from half way along). The rest of the group were then ferried around to Coulter Drive, and again two teams were formed, one to sweep a line through the Reserve (Team 5) and the other to sweep through the rural lease (Team 4). As before, kangaroos passing through the sweeping line were counted, and those that moved ahead of the sweeping line were counted as they passed through the people stationed along the red line labelled 3. In this way we could be reasonably sure that all kangaroos in the target area were included in the count while at the same time avoiding the risk of kangaroos being frightened into crossing the boundary roads. The success of the technique was attested to by the results. The estimate from the morning count was 762 while for the afternoon it was 783, a difference of only 21, or less than 3%. The average of 772 was taken as the "official" result of the count. The above numbers refer to Eastern Grey Kangaroos (EGKs), the predominant species on the Reserve. As well, however, two Swamp Wallabies were counted, which was a pleasant surprise for many. Using the area bounded by the roads and the suburbs (357 ha), this number translates to a kangaroo density of 2.16 EGK per hectare. Many thanks to everyone and their supporting families for making the survey a success. We received a great deal of positive feedback from Don Fletcher on how the day went and on the fotpin participation.